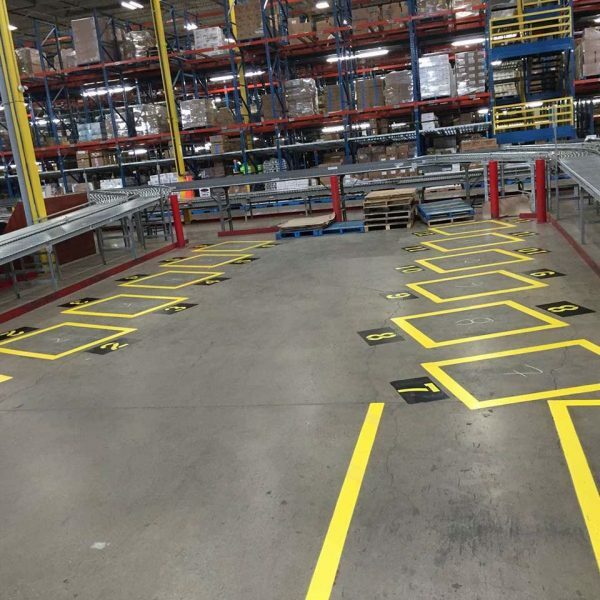 Warehouse floors need lines and signs for two reasons: Safety and Efficiency. 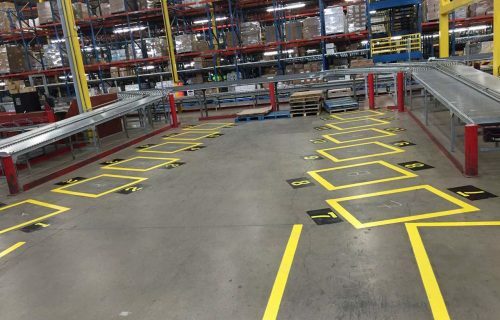 Floor-Marking for Safety – It’s the Law! 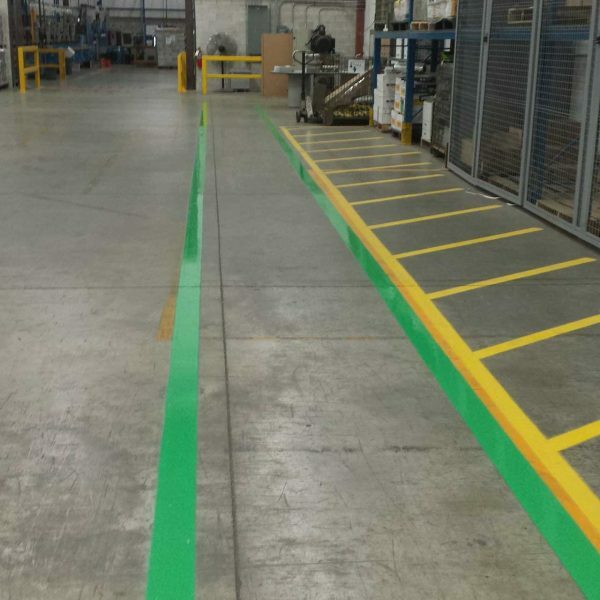 Some other markings are not required by-law, but they improve workplace safety and efficiency. We follow three key steps. How much traffic flows in your area? This chart helps define your traffic level. The top choices are paint or tape. Paint is a good choice for light to medium traffic areas. Paint is also usually the cheapest option. Application of a sealer over the paint makes it collect less dirt and easier to clean. 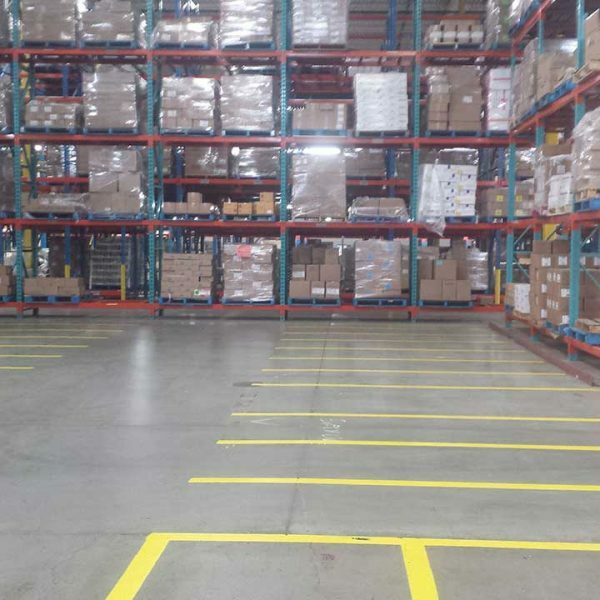 Epoxy solutions are best for heavy and extreme traffic areas. 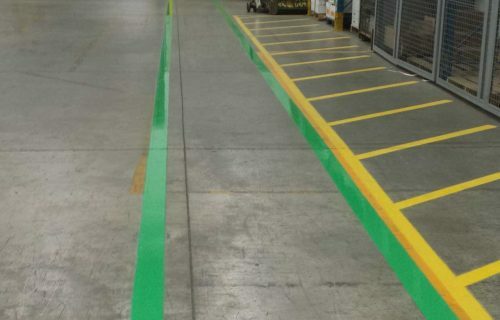 Epoxy solutions are more expensive than traffic paint, but worth the investment. 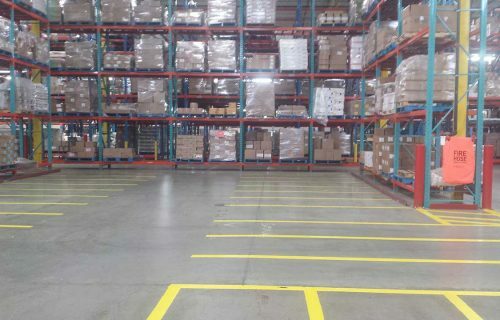 Epoxy floors have a long lifespan. Concrete is the only superior material. Fully solid epoxies cannot be sprayed. They require significant manual taping. Here’s another option: traffic marking tape. It costs more than traffic paint but less than epoxy. It’s not complicated to install, and usually your own staff can apply it. In our experience, tape is suitable only in areas with light traffic level. Please note: As a rapid cure product, Methyl Methacrylate (MMA) is good for projects where downtime must be kept to a minimum. However, MMA is not as popular as Epoxy or Acrylic because of use restrictions. MMA is not used in areas where products may be contaminated, although sealed or non-absorbing goods are safe. This step is crucial. 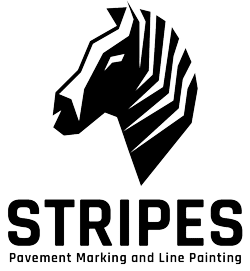 Start by preparing your concrete – it will give your floor markings longer life! In this stage, we prepare the floor by eliminating oil and dirt, removing thin top layer exposing a clean bare unsealed surface. Diamond Shaving – “shaving” away 1mm to 5mm of the surface creating a channel. The paint is applied to the channel creating a recessed line level with the original floor surface.